For those who follow a Protective Diet lifestyle we must learn to build on what we’ve started. For me, I started this whole foods, plant-based journey in 2011 behind Dr. John McDougall and the documentary, Forks Over Knives. Thankfully I found my way to Julie and her Protective Diet, taking the plant-based lifestyle to a healthier dimension. I do appreciate all the information supplied by Dr. McDougall because without him, I probably would have never made the change. My transformation was staggering, to say the least, but not unexpected. However, there were points in the journey that saw me take a few steps back before making a small gain. Maybe that is to be expected. We know this lifestyle has amazing health benefits, we watch Julie and listen to her on a variety of lifestyle topics. We read testimonials from other PD members but yet we still hold onto some doubt that it won’t work. While I never stopped following a Protective Diet lifestyle, I did slide far enough away that I needed to reassess where my health was at. A blood test was not needed to tell me I wasn’t in a good place, every time I stopped to get fast food, I felt guilty, knowing it was a wrong decision, yet nearly every time I went through with it. So here I sit, looking to build up a strong foundation I laid years ago. Thanks to people like Julie Christensen, John McDougall, Dr. Esselstyn and Dr. Campbell. While I did not resolve to “follow a PD lifestyle” ahead of 2018, I did recommit myself to change. Again, pictures are worth a thousand words and while it might be monotonous seeing my before/after picture, it’s a driving factor for me. I recall how strong I felt when I participated in my final Tough Mudder event in 2014. The previous year was even stronger, as I said, “I accomplished more than I ever could imagine. 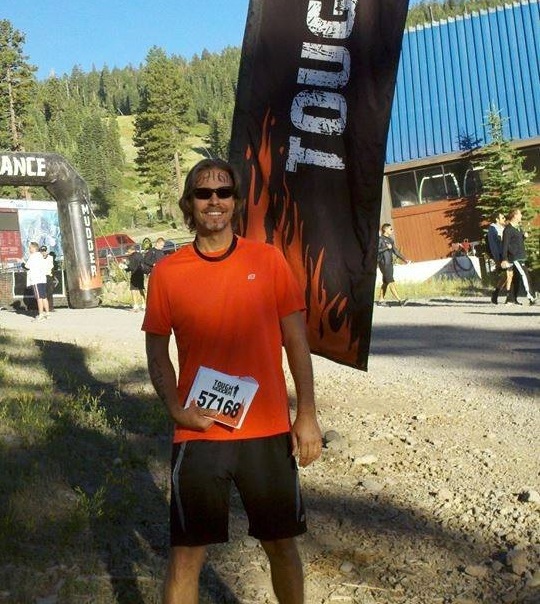 While I won’t call Tough Mudder easy, it wasn’t as difficult as I had made it out to be. 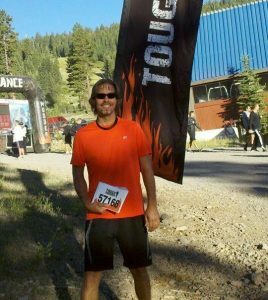 I had fears to face out on the course, which only strengthened my resolve and increased my confidence when I accomplished certain obstacles.” This was a result of improving my health and gaining strength. Even now, I am sure there will times of weakness or exception made. While I admire those who hit that “100% PD compliant,” I am not sure I am at that point. Yet. Even when I was a mindful eater, running and lifting weights on a regular basis, I still had my weak moments but those did not dominate my lifestyle, like they do now. Those little moments did snowball and gain momentum, which eventually saw my lifestyle and health do a complete turnaround for the worst. So maybe those “weak moments” are the ones I attempt to work out this time in order to achieve and more importantly, maintain my health. 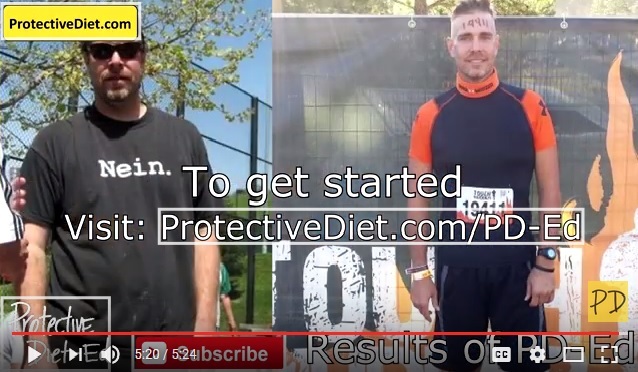 This October will represent 5 years since I have taken control of my health thanks in part to Dr. John McDougall and Julie-Marie Christensen of Protective Diet. It’s amazing and powerful to see the foods we eat and their effect on our health. While I don’t want to measure my success solely in terms of weight loss, there were many benefits that went along with losing 44 pounds in 10 months. Many ailments and problems I had seemingly disappeared as a result to my commitment to health, results of my blood tests revealed my high cholesterol had decreased by 134 points! Looking in the mirror I saw a new, slimmer, healthier person looking back. It was a great feeling! Here’s a quick video, look for me at the 5:21 mark. Along with these benefits, I took up running, to help supplement the weight training I had started. 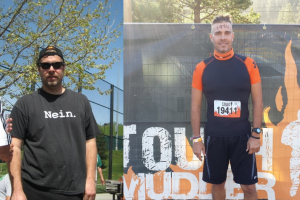 With a renewed vigor I started participated in Tough Mudder with co-workers, which tested my mental and physical abilities. I wanted to push and learn what limits my body could endure, so I signed up for my first half marathon, which I finished in 1:58, followed by my first 50k (31.7 miles) a year later in 8:53. If that wasn’t enough I have run three 50 mile races the past 2 years, posting a PR earlier this year of 13:40! The results were proof to me that without taking control of my health none of this would have been possible. It’s amazing to hear Julie speak about her passion that is Protective Diet, she inspires many she touches with her (and Jerry’s) positive message about health and the foods we eat. Reading and hearing testimonies from other ‘PD lifers’ should be proof that what Julie teaches works. While I was never skeptical, I was impressed with how I further cleaned up a diet that already had removed meats, dairy and oils. Seeing the many vibrant and smiling individuals on the Protective Diet Living page only helped to reinforce her message and my life changing decision. Somewhere during my journey, over the past 4 years I hit a bump, which turned into a slide and suddenly I found myself out of control, falling back on poor decisions and bad habits. Through it all I stuck to the basics that got me here; no meat, dairy and oil while following a starch based diet as Dr. John McDougall promotes. Yet the gains I had achieved were slowly fading into the past. I attempted to remain positive, knowing that if I achieved these improvements before I could do it again! A list could be draw up, excuses made but honestly, what good would it serve? None, I lapsed and now it’s time to refocus and get my health back on track. Today was ‘Day 1’ and I am sure MANY Protective Diet Living subscribers know what I am talking about. As the saying goes, “tomorrow is a new day…” That is what today was, a new day, one in which I watch Lesson #97 on Protective Diet to get me pointed in the right direction and take control of my health, so I can look and feel like I did a short time ago. At no point do I feel as if I failed myself or others when it comes to this lifestyle, as I was able to stick to the basic principles, but Julie is able to take that change to the next level. That is where I want to return to. Being able to confidently say I love what I eat and how I feel. No one should ever feel as if they “can’t do this” or “won’t have success.” I know both of these statements will not hold me back as I have bigger plans in the future. With so much going on in life, free time hasn’t been abundant, but the time I had could have been spent more wisely with regards to running, an activity I thoroughly enjoy. Earlier this year I had plans to add two more ultra marathons to my list. The first, Pioneer Spirit 50, a 50 mile race from Cool to Folsom with a portion of the trail familiar thanks in part to running the American River 50 Mile Endurance Run, twice. This was supposed to be a training run in August, for the Folsom Lake Ultra Trail 110k, a a 68.35 mile race around Folsom Reservoir. Both races are more difficult and challenging, mentally and physically. Right now I am not at my best health, but both these races are on my calendar for 2017. If that’s not enough running, I plan on attempting my first 100 mile race in March next year at the Razorback Endurance. This will be the first time at this distance with a 36 hour cutoff and relatively no vertical component on the 2-mile loop. This is truly the biggest challenge I want to attempt, even if it’s only one time. In order to be successful I need to be mentally and physically prepared for this challenge. Here’s a quick video, look for me at the 5:21 mark. Each of these reasons “excuses” could be applied to why people don’t take their health more serious and make changes that they would benefit from. I admitted to myself for 42 years that “I was fine.” This when dining on fast foods, fried foods, dairy and meat while not enjoy veggies and limiting starchy foods. I knew I had a problem, but I wasn’t strong enough to face the fears associated with making change. Then something amazing happened, so unexpected it was exhilarating as I looked towards the future, seeing a happy, healthy life ahead. I accepted the change and challenged myself to accept a new, plant based lifestyle leaving behind the foods that were the cause of all my health related problems. I know this sounds like fiction and many won’t think twice about it or consider change in their life, continuing to follow their “healthy” lifestyle that includes meat and dairy. I don’t care if you are gluten free, buy only organic, believe grass fed beef is somehow healthier or still hold on to the belief that fancy cooking oils are beneficial. The fact of the matter remains, your decisions on foods are the key to your health and many Americans continue to make the wrong decisions. As the saying goes, “you can lead a horse to water, but you can’t make it drink.” Change doesn’t come without dedication, effort and a bit of struggle. I know this as well as anyone when making the decision to get healthy, which I did in October, 2011. Yet 3 years later people continue to find excuses not to take establishment to keep them healthy. Left: The “SAD” days. Right: Powered by plants! If literature and words are not enough to convince the majority to reconsider, how about leading by example. That is what I am, living proof you can take control of your health, forget about doctors and medicine and heal yourself. The transformation has been nothing short of amazing! Gone are all the maladies I once struggled with; my weight, aches and pains, including consistent migraines, foot problems (plantar fasciitis), stomach issues and lethargy. People willing to try could be rewarded in as little as 12 days at no cost to them thanks to Dr. John McDougall and his free McDougall Program. The Internet is chocked full of beneficial information, programs and recipes to assist individuals in their quest for health. Julie Marie Christensen at Protective Diet promotes “a diet rich in whole plant foods, free of all animal products, saturated fats, oils, nuts, sugar, artificial sweeteners and food additives.” It takes 30 days to “eliminate the physical addiction… then our taste bud receptors are not searching for the missing oils and fats any longer.” Why not start now? Conversely I hear many complain about just how expensive it is to eat a plant based diet. According to the IRS, the average person in America spends $301 on food, and the average family of four spends $765. According to the US department of Labor, a typical family of four eating “moderately” at home in 2011 spent $664. But that’s eating many processed foods (source). I’m not saying to spend $1.50 a day on food as Darshana Thacker did on Forks Over Knives, but by following some simple rules you can save money following a plant based lifestyle. Buy in bulk: beans, grains, pastas, flours, herbs, spices and nutritional yeast are staples in my pantry. Make a list: write down what you want to buy and go into the store with a purpose, this will help limit food and ingredients you don’t need. Comparison shop and coupons: visit a few different grocers to see which store has weekly deals or sales going on. Watch Sunday papers for coupons, which could allow you to save additional money. Buy frozen and canned food: some veggies and fruits are season, so you might need to find another option. Frozen veggies are inexpensive and can be used in a variety of ways. In a pinch, canned ingredients (BPA free) can be used if something is not in season or unavailable from the bulk bins. In the past I have primarily used beans and tomatoes. Menu planning: create a menu for the week, figuring in the amount of leftovers that could be used for additional meals during the week. Meal planning will allow you to create a more accurate shopping list. Some of these suggestions are good practice in general regardless of the foods you eat. Initially stocking your pantry could require a bit larger of a cost, but in the long run removing the pricey cuts of meat, dairy such as cheese and processed foods will result in substantial savings over time. The argument from many usually includes, “I’m going to die anyways, so I am going to eat whatever I want.” By all means do what makes you happy, but expect the possible consequences that come with eating a diet high in red meat, sugary drinks and desserts, high-fat foods, high-fat dairy products, and refined grains. The cost could be your life. You might suffer a heart attack and be diagnosed with coronary heart disease (CHD) requiring open heart surgery. Both of those options sound extreme to me. A plant based lifestyle offers results, but only if you WANT to take control of your health. People need to put down the fork and pay attention to what is happening to their health. Many won’t, continuing to eat an industrial, Western pattern or “standard American diet,” characterized by high intakes of red meat, sugary desserts, high-fat foods, and refined grains. It also typically contains high-fat dairy products, high-sugar drinks, and higher intakes of processed meat (source). Your worst enemy, the fork. 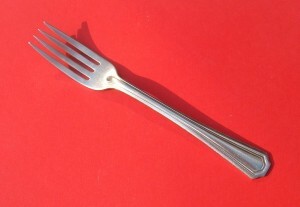 This utensil has lead to one-third (34.9% or 76.4 million) of U.S. adults being obese. “Obesity-related conditions include heart disease, stroke, type 2 diabetes and certain types of cancer, some of the leading causes of preventable death” (source). Yet with obesity numbers continuing to rise and the top 11 pharmaceutical companies seeing profits of $85 billion (in 2012), the message continues to be largely ignored. 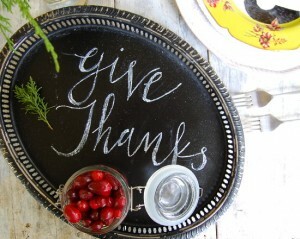 As we approach Thanksgiving, I have much to be thankful for. I have a beautiful wife, wonderful son, a great job, good friends and most importantly, my health. That’s similar to what some of my co-workers would say, with the except of controlling their health. As traditionally happens at the workplace, a potluck takes place and each employees provides a dish to share. This year, many wanted to pass on the early helping of turkey, stuffing and mashed potatoes and opted to do breakfast/brunch. While sharing ideas I was taken back by the negativity, jokes and rude comments when offering plant based suggestions to share. The responses were not surprising, the entire office knows I follow a strict plant based lifestyle, which some believe is void of flavor and no fun. Through education, experience and challenging myself with plant based recipes nothing could be further from the truth. I use my wife is the measuring stick, if she eats the plant based recipes I cook and likes it others will too! The reality of the situation, it no longer bothers me but one would think I was offering servings of poison by the reactions I receive every time we discuss food and toss out truly healthy alternatives. Why? Can’t people accept he fact they can be healthy AND happy? As Dr. John McDougall says, “People love to hear good news about their bad habits.” That is how many individuals have chosen to eat and many willingly accept the future consequences to their health. Give plants a chance and be thankful.